This post is a sponsored partnership with Astrobrights. I received products and compensation for this post, however the opinions and Astrobrights obsession are 100% my own. This post may contain affiliate links at no extra cost to you. The concept of printing on colored paper is absolutely GENIUS! I discovered ASTROBRIGHTS© Papers my third year of teaching and was thrilled that not only are the vibrant colors happy, eye catching, and made my life much more productive, Astrobrights saved me TONS by reducing the amount of colored ink I used. Colored ink is so expensive! A neon product that saves me money in the long run? What teacher doesn’t need to save money? That’s a win-win in my book! Because color is a powerful element of visual communication, before they are consciously aware of it, children start processing this important component of visual language early in life. And color plays a critical role in the world of education – it’s been scientifically proven that a classroom’s visual environment helps stimulate learning. Here are 5 ways to use Astrobrights in your classroom! 1.) Classroom décor to match any theme. With more than 20 different Astrobrights colors, you are sure to find colors to match any scheme. By printing black and white images and text on Astrobrights, you get a vibrant design with no need for colored ink! While my neon-rainbow classroom theme allowed me to use all 25 colors on the Astrobrights spectrum, you can mix and match to find the style you like. Astrobrights bright, cheery colors help adorn a blank wall. Whether you’re color-coding your classroom by individual student or groups of students, Astrobrights allows you to color code with ease! 3.) Turn worksheets into hands-on activities to use for years to come! Did you know cut-and-paste worksheets can easily be used year after year? The colored paper makes the activities more eye-appealing for students, while they practice and learn new skills! Simply print on Astrobrights paper. Laminate and cut out any matching pieces. Add Velcro and there you have it! Hands-on activities that are ready for years to come! Color makes it easy to scan and locate items quickly. That’s why I use Astrobrights to label any and every bin, container, and desk organizer in sight! 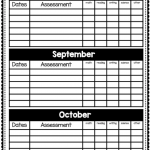 Here are easy-to-print labels to help you organize all your classroom needs! 5.) Parent notes that won’t go unnoticed. If your classroom is anything like mine, paperwork has a tendency to go unnoticed in a students’ backpacks. Printing important notices on Astrobrights makes these reminders less likely to get overlooked. Because how could one miss a field trip reminder when it is printed on Re-Entry Red™? I wondered where you got the wire colored cups that you have both in your caddies and on top of your teacher toolbox. I am excited to be able to follow all your ideas! Thank you for your sweet comments, Katherine! The pencil holders were a gift, so I don’t know where they were purchased. I love them, too!